If you want to see the trajectory, enable the Show Control Points on Selected Layers preference. 1. In the top menu, select Edit > Preferences (Windows) or Animate Pro > Preferences (Mac OS X) or press [Ctrl] + [U] (Windows) or [⌘] + [U] (Mac OS X). 2. Select the Camera tab. 3. In the Control Points section, enable the Show Control Points on Selected Layers preference. 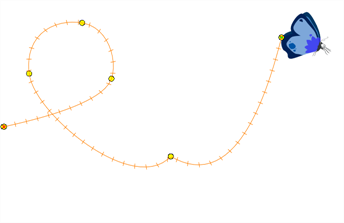 If the trajectory is hidden when you select an element, you may want to display it using the Control command.